In honor of the triumphant Los Angeles Dodgers, we present this 145-year-old map of the land where Dodger Stadium now stands, the first of its kind to be drawn up. Chavez Ravine has been measured and argued over since the mid-19thcentury, when L.A. cartography was still a rather new occupation. Nevertheless, the city was growing and had to be measured. The map is clearly outdated (as evidenced by the scale at 1: 8 chains, or 528 feet), but this was one the city produced in an effort to sell off lands, an attempt to alleviate city indebtedness after statehood in 1850. It was created at the request of the city attorney A.J. King and attested to by members of the illustrious Mott family, delivered to the city and signed by then-mayor Cristoval Aguilar. 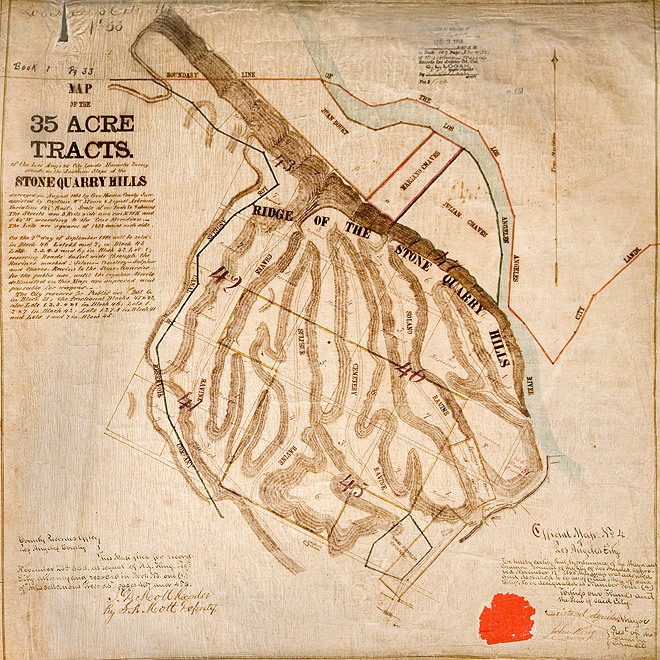 The document calls for the creation of roads 60 feet wide, nearly even with the distance from the pitcher’s mound to home plate in today’s stadium (60 feet, 6 inches). The most famous landmark seen here is Chavez Ravine, given to former city councilman Julian Chavez who, way back in 1844, received 83 acres up on the highlands outside of the pueblo. Eventually the many rolling hills were turned into public parklands at the urging of then-City Engineer George Hansen, and in 1886, 550 acres of the land were turned into Elysian Park. In the end, a great baseball stadium rose up in the area known almost a century before as the Stone Quarry Hills. Not that baseball fans are superstitious, but the numbers call out from the map: Official Map No. 4 (Dodger great center fielder Duke Snider), Chavez Ravine lot number 42 (Jackie Robinson), and the spot of land at the rear of today’s bullpen may be lot 5 (Juan Uribe’s clutch home run in 2013).